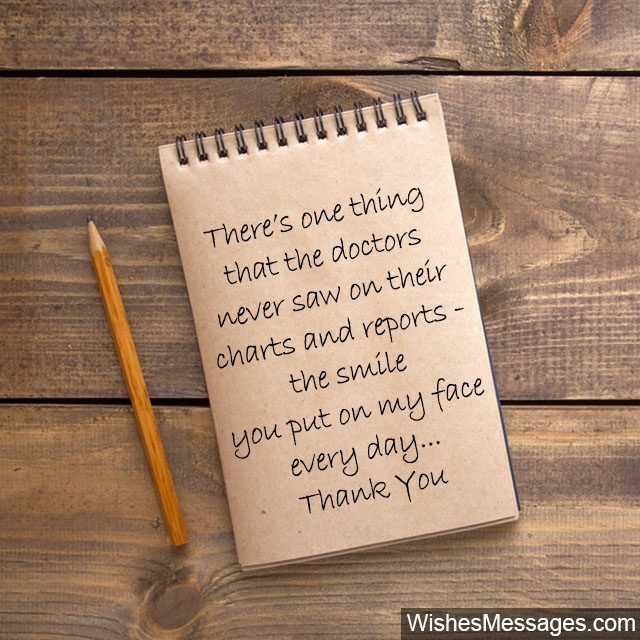 Thank You Notes for Nurses: If you’ve been at the receiving end of a nurse’s healing tough, make sure you give it back with a sweet message to say thank you. Maybe even buy a cute gift that goes with your Thank You card. Why? 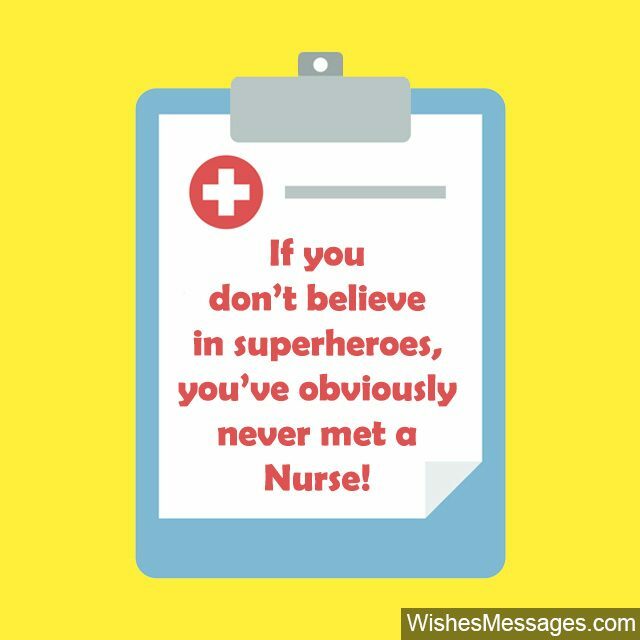 Because nobody realizes the superhuman strength, compassion and care it takes to be a good nurse. Erratic work timings, watching suffering day in and out, dealing with patients and the never-ending list of tasks…. being a nurse is anything but easy. Yes, nurses get paid for what they do but no amount of money can buy true empathy or a genuine feeling of care. Some people say that nurses are angels and we agree 100%. Hospitalization for surgery, school health services or a visit to the hospital for a routine checkup – make sure you put a smile on the faces of the unsung heroes that put a smile on yours, when you needed it the most. 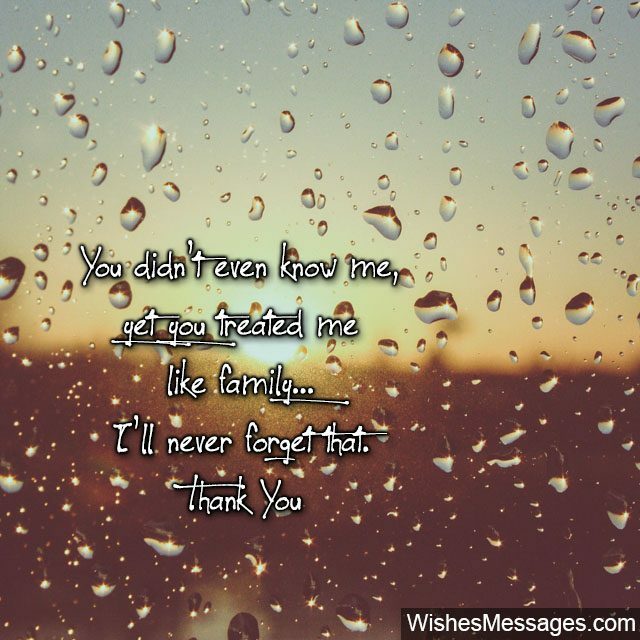 1) You didn’t even know me, yet you treated me like family… and I’ll never forget that. Thank you. 2) Angels come in all forms, but the best ones are called nurses. Thank you! 3) I don’t think there exists another profession where a caring attitude is as equally important as a fancy degree. Thank you for being an awesome nurse. 4) Doctors give medicines, nurses give hope. 5) The hospital cared for me like a patient but you cared for me like family. Thanks for everything. 6) This is not just a Thank You note for you but also a request to your boss to give you a raise. All the countless smiles on the faces of people you care for are more powerful than a letter of recommendation anyone could ever write. Thank you for putting one on my face too! 7) I want you to know that my journey to recovery would have been incomplete without seeing your smiles every day. It would have been impossible to remain positive had you not given me hope through these tough times. 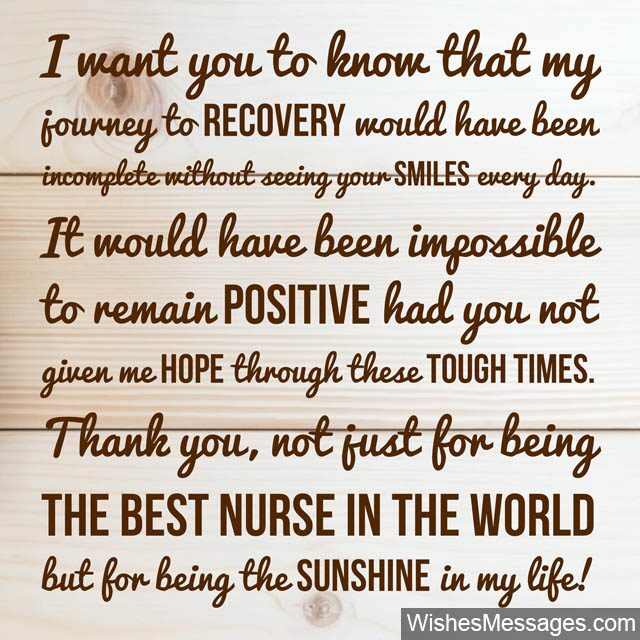 Thank you, not just for being the world’s best nurse, but for being the sunshine in my life. 8) Doctors cannot be doctors without degrees. Nurses cannot be nurses without love. 9) You’ll never realize how heroic nurses are, until you actually need one. That’s the lesson I’ve learnt and I’m glad I learnt it with you. Thank you. 10) I can’t put into words the gratitude I feel when I think about all the emotional support that patients get from nurses. It may not be quantified or described in medical terminology, but it’s healing powers are more than anything else there is. 11) Help, heal, inspire – that the job of a nurse. Thanks for being an awesome one. 12) Nurses are a perfect reminder of the fact that there may be a lot of evil out there in the world, but humanity still exists. Thank you for everything. 13) There’s one thing that the doctor’s never saw on their charts and reports – the smile you put on my face every day. I thank you, not just for being a nurse, but for being the biggest support I could ever have had. 14) What you do day in and day out is nothing short of heroic. Thanks for being a terrific nurse. 15) Nurses are angles in disguise. Why else would people thank someone for poking them with needles? 16) One of the most important qualifications of a good nurse, is to be a good human being first. Thank you for taking such good care of me. 17) I’d like to believe that I pulled through all because of my will power but the truth be told… my anxiety, my pain, my nervousness, my need for a funny friend during these times – all would have been impossible to manage if you hadn’t been by the bedside whenever I needed you to be. Thank you for everything. 18) Just a few weeks back I didn’t even know your name. Today I feel blessed to have met you. Thank you for being the best nurse in the world. 20) The biggest medicine was the smile that you put on my face. Thank you. 21) There’s a word that may not exist in medical terminology but sure does in the hearts of nurses like you… and that word is CARE. Thanks for looking out for me. 22) Nothing comes close to the healing powers of a nurse who truly cares. I owe my recovery to you. Thanks for everything. 23) Thank you for taking care of my children as if they were your own. 24) Nurses are the reason why people walk into hospitals with anxiety and walk out with smiles on their faces. 25) Real heroes don’t wear capes. They wear scrubs, work in hospitals and are called Nurses. Thank you for being my Batman. 26) The cold walls of a hospitals are made friendlier because of nurses like you. Thanks for taking such good care of me. 27) Nurses are soldiers. Fighting illness every day with unlimited kindness, compassions, empathy and healing. I salute you. 28) Not a day goes by without me thinking about how you made me feel at home in the hospital. Not a moment goes by when I don’t have an overwhelming sense of gratitude for you… for going above and beyond your call of duty and looking after me like family. Thanks for everything. 29) Degrees, knowledge and experience are a must but at the heart of every nurse’s job, lies compassion and care. This is what I’ve realized and thank you for putting up with me all the time. 30) No millions or billions can ever do justice to the amount of care and empathy you show towards your patients. Thank you, for not just being a nurse but a true hero. 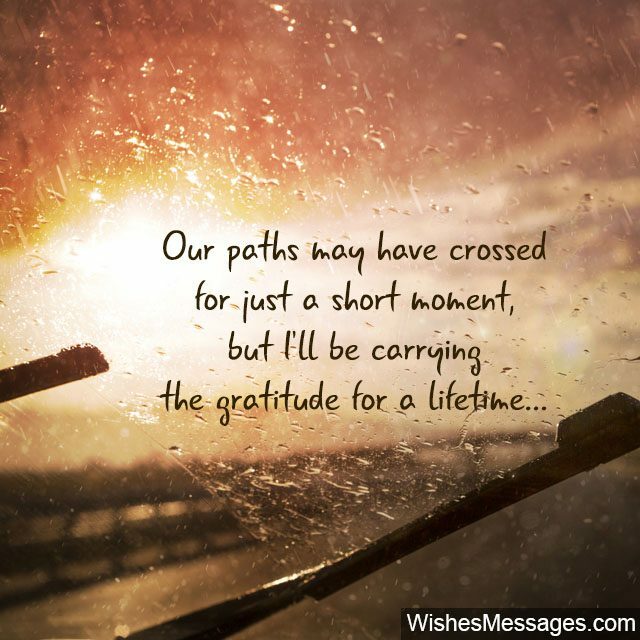 31) Our paths may have crossed for just a short moment, but I’ll be carrying the gratitude for a lifetime. Thank you for being the best nurse in the world. 32) Only one thing can make the hospital a friendly place – a nurse’s smile. Thank you for everything. 33) From being a total stranger to the most favorite person in my life – thank you for caring for me just like how my mother would. 34) Ever since the day our paths crossed, it has opened my eyes to the fact that nursing is much more than what meets the eye. Thank you for everything. 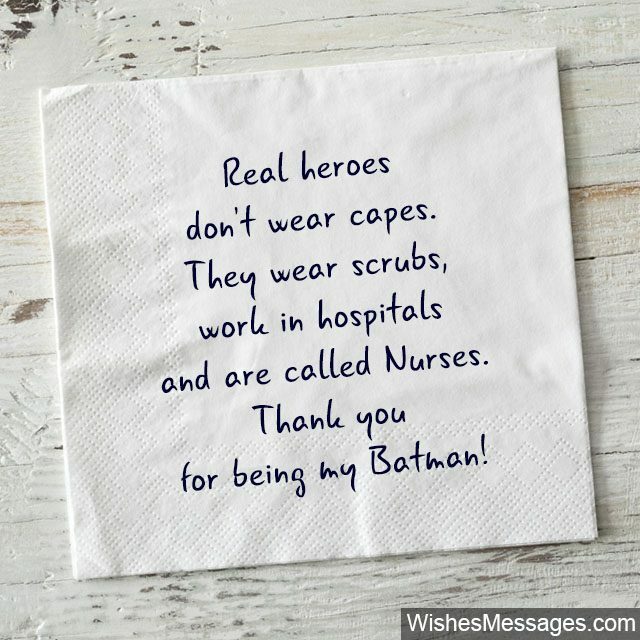 35) Superman and Batman are no match to the kind of hero nurses are to hundreds of life every day. 36) I never did realize what went into being a nurse, until I needed one. Thanks for everything. 37) I can’t even imagine what kind of toll your job must take on your personal life. 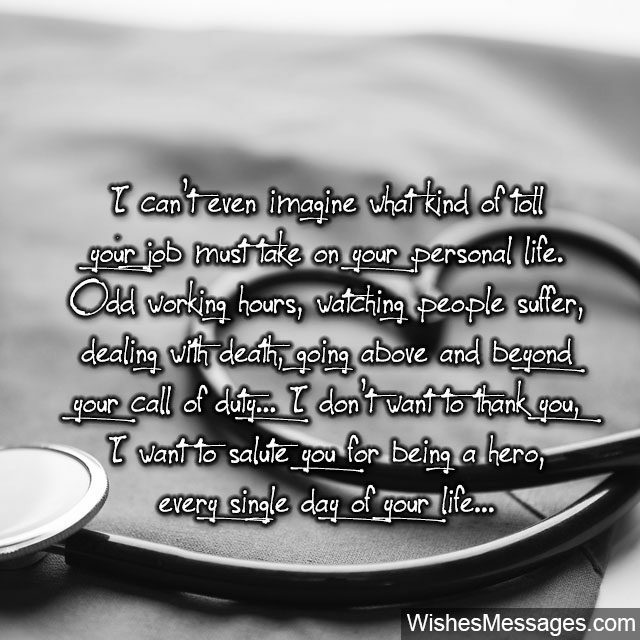 Odd working hours, watching people suffer, dealing with death, going above and beyond your call of duty… I don’t want to thank you, I want to salute you for being a hero, every single day of your life. 38) Yes I know it’s ‘Like a Boss’ but it should actually be ‘Like a Nurse’… I can’t think of anything in life that comes close to the kind of emotional strength and calm it takes to be a good nurse. I’ve realized this, only after I’ve been under your care. Thank you for everything. 39) Doctors prescribe, nurses heal. 40) Compassion, selflessness and never-ending love… that pretty much sums up every day in a nurse’s life. Thank you for being one.